If you’re with an ISP that offers Fetch TV it’s well worth considering, especially if you are a bit of a TV junkie who doesn’t care for typical pay TV, but likes the idea of easily accessing more channels as well as common catch-up services, and even movies, all from the same interface. It may look like a plain old box, but the Fetch TV set-top box houses plenty of hardware and software capabilities that can freshen the way you watch TV. It’s a box that’s available from a couple of ISPs, namely iiNet and Optus, and if you sign up for it you get access not only to a box for watching and recording free-to-air TV channels, but also access to on-demand movies, subscription channels, and much more. Indeed, the big thing about the Fetch TV set-top box is that it can be much more than a delivery mechanism and recording device for free-to-air TV channels. It’s designed with the knowledge that people want more than what traditional TV offers, and this includes access to subscription channel packages, on-demand movies, and the integration of many ‘catch-up’ Web services such as ABC’s iView and SBS’s OnDemand. Basically, it’s an all-round entertainment device. The hardware includes a 1TB hard drive for storing recordings and facilitating time-shifting, and there are three digital TV tuners built in so that you can record from two free-to-air channels while watching a third one. Setting up the Fetch TV box relies upon a few connections in order for your TV watching experience to take off: you have to connect your TV antenna to the box, you have to connect the box to your TV (via HDMI preferably), and you have to connect the box to your router so that it can receive online content. That last connection might be a bit of an inconvenience to some of you if your router is not located near your TV. Fetch TV, and the ISPs that offer Fetch TV, want your experience with the product to be as smooth as possible, and the smoothest experience is offered when the box is directly connected to a router via Ethernet, which can guarantee a solid transfer of data from the Internet to the set-top box. However, if your router isn’t near your TV and you don’t want to run a long Ethernet cable through your home, you can opt to get a bridge device that will give the Fetch TV box the ability to connect to your router using Wi-Fi. Or, you can get powerline adapters that use your existing electrical wiring as the medium for an Ethernet connection between the router and Fetch TV. At the other end, you’ll also need a fast Internet connection of at least 3Mbps, which your ISP will be able to qualify to make sure you can get a good experience. When using Fetch TV’s subscription TV channels and on-demand movie services, they will be delivered through your Internet connection as IP (Internet protocol) TV. The data from these channels and movies won’t count against your overall data allowance, so you won’t have to worry about going over any limits. Catch-up services, such as ABC iView, and also YouTube, will count towards your data allowance. Other connections that can be made include optical audio output to your stereo system or home theatre, and antenna pass-through to your TV so that you can still use the tuners in your TV through the same antenna. 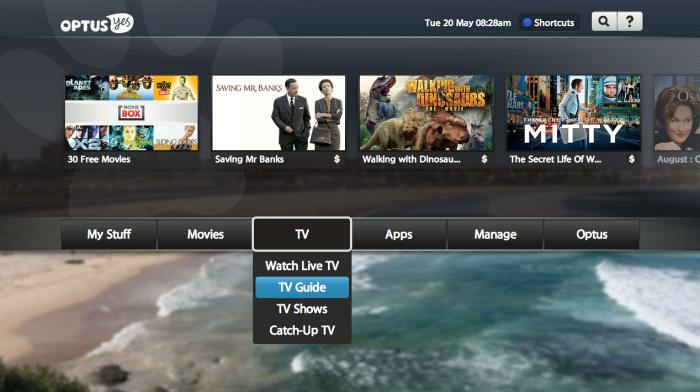 Once it’s all set up and running properly, you’ll notice that the interface for Fetch TV is simple and clean. It offers all functions via an intuitive menu system that can be accessed by pressing the ‘paw’ button on the remote control. You’re able to effortlessly switch between free-to-air channels, on-demand movies, subscription channels, catch-up services, YouTube, and even any of your own content that’s stored and shared on computers or storage devices on your local network. By default, the Fetch TV service comes only with the ability to watch, record and time-shift free-to-air TV, as well as watch catch-up TV, and rent movies on an on-demand basis (though this depends on the ISP offering). Prices for the rental movies vary, and the rental stays active for you to watch for a period of 48 hours. We like the implementation of catch-up TV through Fetch, mainly because it gives a common interface to both ABC’s iView and SBS’ OnDemand services. You don’t have to get used to different layouts and the content is sorted easily for you to peruse. At the time of writing, Fetch TV was in the process of adding TenPlay to the mix, and said there was more to come. You can’t record programs from the catch-up services; by definition, they are there so you can catch up on programs you missed or failed to record. For free-to-air TV, you can use the comprehensive electronic program guide (EPG) to figure what to watch and record. It’s maintained with the latest possible data so that it knows if a show is going to start earlier or later, but there is still some padding added to make sure your favourite shows are recorded in full (and this can be manually adjusted, too, in case of sporting events, for example). The neat thing is that you can record either single episodes or set series tags so that each episode of a particular show is recorded. That comes in handy when you will be away or simply don’t have time to watch during the week. Recordings are sorted in folders according to the show you have recorded, and are simple to browse. Furthermore, the shows are then grouped via season, and you can see the date of the recordings. Recordings you have watched will be marked with a tick. You can also elect to keep only the most recent recordings of a series and discard the rest. The real value of Fetch TV is in the subscription TV packages that are provided. Fetch TV caters to those of you want to watch documentaries, kids shows, classic TV shows, music videos, and also world programs. Its Entertainment Package is an extra that includes channels such as National Geographic, MTV, Disney, TVH!ts, news channels, and more. Basically, you get up to 30 extra channels to watch. If you go with iiNet, this package also includes Movie Box (with Optus, Movie Box is part of the standard Fetch TV package). This is a service that features up to 30 on-demand movies that you can watch at any time. One new movie is added every day and one old movie is taken out, so there is always something new to keep an eye out for. When you want to watch a movie, it will buffer a little first before you can actually hit play. You can stop and resume the movie at any time. Other subscription packages that are available include Setanta Sports, for those of you who love soccer and rugby union, Ovation, for those of you who love the arts, and there are numerous world TV add-on packs. This is one area in which Fetch TV hopes to differentiate itself, too, by offering channels that are a hit for those of you with different backgrounds. Currently, the world packages include Great Wall Mandarin, TVB Cantonese, Korean, Taj Mahal, Pinoy, and Sun South Indian. 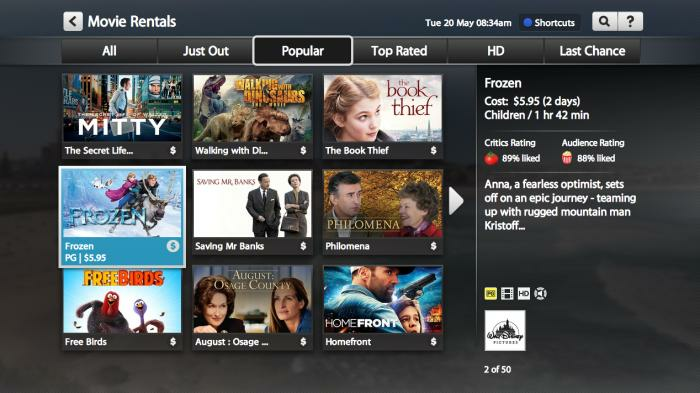 If you add one of these subscription TV packages to your Fetch TV, shows from those extra channels will also appear in the EPG so that you can seamlessly watch and record them, too. In fact, that’s one of the things that makes Fetch TV so intuitive: all of the channels appear in one list (which you can customise) and this makes the viewing experience enjoyable, but at the same time a little tiring due to the long list you have to scroll through. Subscriptions can be made through the interface, and you can unsubscribe and re-subscribe at any point. They are available on a month-to-month basis and there are no lock-in periods. The interface overall is a pleasure to use because it doesn’t take long to figure out where things are kept, and it’s also swift, both when it comes to navigation and changing channels. As mentioned earlier, the EPG houses all of the channels you can watch, but there is also easy access to kids shows, to the Movie Box and rental movies, and you even get recommendations, as well as the ability to browse Rotten Tomatoes ratings before viewing. Recorded TV shows are held in their own location, under the same My Stuff menu as the Media Hub. The Media Hub allows you to browse content that’s stored on computers and storage devices on your network. It uses DLNA to look for media servers on your network. Furthermore, you can plug a USB hard drive directly into the Fetch TV box. This works well for downloaded content such as MP4 files. A YouTube app is integrated in the system, too, and this can be used efficiently with your smartphone or tablet. You can search for videos on your mobile device and then send the play command for them to appear on your TV through Fetch. Before this can work, you have to register your smartphone or tablet with the Fetch TV box so that they can communicate directly. 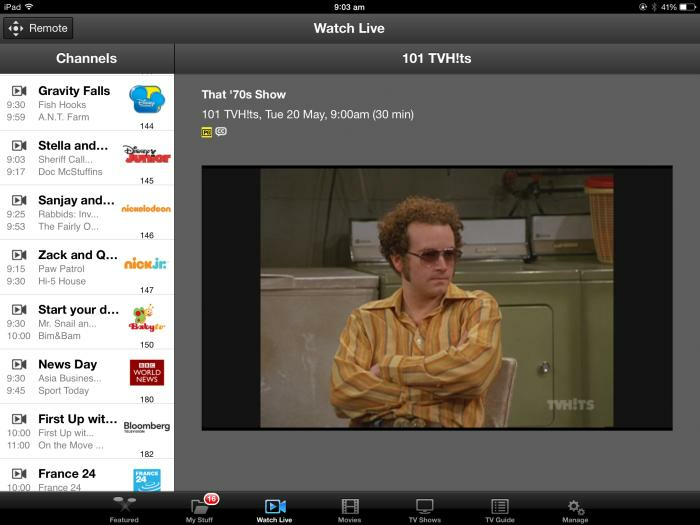 Watching subscription TV on a tablet. Mobile devices are further catered to with the Fetch TV app, which allows you to control the EPG and playback, as well as watch content from any of your subscription packages (but not free-to-air). We think of Fetch TV as a souped up set-top box, and one that’s perhaps the best there is on the Australian market. It’s easy to use, but most importantly, it integrates free-to-air with online services and local network content very well. We don’t have much to gripe about at all, except for the storage space, which we think should be larger considering there are drives with up to 4TB available these days, and the remote control also needs refinement. Some of the buttons are laid out unconventionally and require some learning. Physically, the box isn’t anything special to look at, either, and its status LEDs are a little harsh on the eyes.